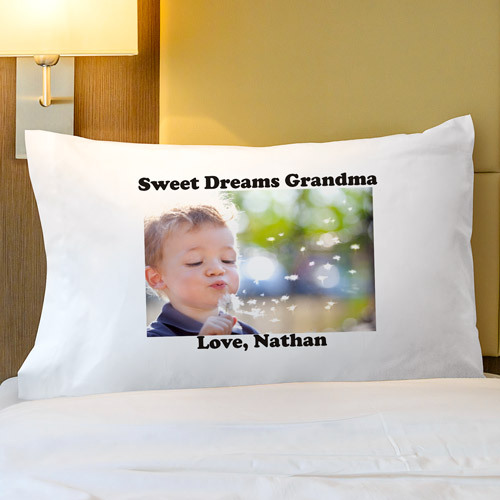 Sweet dreams are guaranteed when you sleep with a personalized photo pillowcase. This custom pillowcase fits any standard/queen-sized pillow and can be personalized with any digital photo (minimum recommended pixel resolution/dpi is 800 x 800) and two lines of caption (up to 40 characters per line) in your choice of text color! This photo pillowcase with custom caption is strong and durable yet soft to the touch and machine washable. It's the gift that's worth a 1,000 winks! Very nicely done. My mother in law loved it. Hello! It's the second time I bought this beautiful pillowcase, when my two and a half year old granddaughter saw that it was for her,she hugged it kissed it, could not believe that that beautiful pillowcase was for her, said that her grandparents give her Beautiful gifts,and love her very much. It is a precious gift,for any little one. My sister who just became a new grandma will love it so she can stay close to her grandchild who lives in another state.